Bathing one’s four-legged family member in a bathtub can be a messy experience. After all, a dirt-covered dog and a clean, white tub don’t necessarily go hand-in-hand. But Bissell is hoping to change the way pet parents give their dog a bath with BarkBath -- a new portable bath unit. The BarkBath features nozzles that get beneath a dog’s hair to remove dirt and odor from the skin up while a soft suction mechanism pulls away grime and water. Bissell says it took two years and “plenty of paws-on research” to develop the BarkBath system, which comes with a main base, flexible hose, and cleaning head. "Bath time can be a huge pain point for both the pet and the pet parent. BarkBath helps make pet bath time faster, easier, and less messy than ever before,” said Chuck Martin, General Manager of Innovation at Bissell. 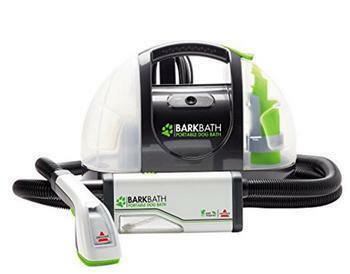 Consumers can clean their canine using the BarkBath simply by moving the cleaning head over their dog’s fur. The head sprays warm water and a no-rinse shampoo onto the coat, the nozzle gets under the hair to remove dirt and odor, and the suction mechanism deposits dirt and grime in a separate tank. The canister-type vacuum, which can be used anywhere in the home, also promises to use less water than if you were to bathe your pup in the tub. Washing an 80-lb dog with the BarkBath uses just 48 ounces, whereas the traditional bathtub method can use up to 19 gallons. Bissell does note that the system emits a sound similar to a vacuum -- the sworn enemy of many a mutt. “For best results, your dog should not be afraid of the sound of a vacuum," the company says. The BarkBath is currently an Indiegogo project, with preorders available starting at $109. Shipping is scheduled for June 2017.